Have you heard of the new site JewelMint? 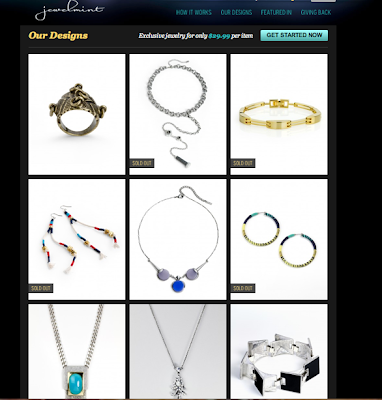 This unique jewelry site is a partnership of Kate Bosworth and her stylist Cher Coulter. Here's how it works: take a style quiz to see what your personalized jewelry picks are and then register for a membership at $29.99/month. Every month you will have jewelry choices, and one item is yours for that price! If you don't want any item that month, simply opt out and you are not charged. Courtesy of the Boston Mint Brand Ambassador team, JewelMint is offering a special 50% discount for the first month to La vie...J'aime readers! Normally $29.99/month, simply enter this discount code: bos881, to receive the first month for half off. Have you tried JewelMint? If so, what did you get? never heard of this site, but it sounds pretty cool! Oh what a cool concept! Def going to check it out! Thanks for the tip Jamie! That's a great discount! I have heard of Jewel Mint before but now I'm much more tempted to try it out! I have been thinking about it - they have some cute things! I have to check this site out! Thanks for sharing!! For those ladies out there who need a style lift, this statement piece is a super quick fashion fix. These kind of jewelries are ideal for day or night, and perfect for dressing up for spontaneous evening dinners. I have been a JewelMint member for about 8 months now and I LOVE LOVE LOVE it! There is literally something I want every month, and the challenge for me is usually narrowing it down to just one piece of jewelry. It's too bad this is limited to new members. That sounds interesting, although I do love the thrill of the hunt! That's a great concept and a great deal! So do you have to return it after the month? Or do you get to keep it? I'm a BaubleBar addict but I've been tempted by JewelMint too!